It has all come down to this. Its so crazy that we’re all caught up on Disney movies now. Its been a great journey. But remember, this isn’t the end. We will still be doing posts from time to time, it just won’t be as frequent for a while. So be sure to check back every now and again for new stuff! Moana is such a great movie, even though I agree with the academy and am glad Zootopia won best picture. We had a party here and made tons of pork and fish for friends to celebrate. Make these foods at home for a real treat! When Moana fixes the roof, one of the villagers comes in with a bowl of pork. 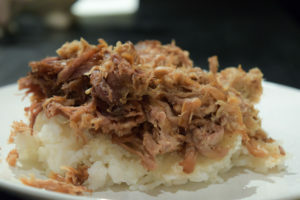 I love Kalua pork so I was super excited to make this. I even went out and got legit Hawaiian sea salt for this dish. Believe me, it’s worth it. This is the most authentic I could get without digging a fire pit in the back of my apartment. Drain the juice, but reserve it. Then shred the pork. In the song “Where you Are,” it talks about how they use all the parts of the coconut. It shows them cooking coconut over a fire inside of coconut leaves. I tried the same thing, but in an oven. 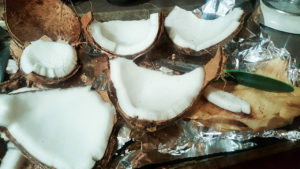 It is actually an easy way to open up a coconut too! We never see anyone actually eating fish in the movie, but we see a bunch of villagers come back with fish to cook. Salt and pepper fish fillets on both sides. Place on a glass plate. Combine remaining marinade ingredients in a small bowl. Pour 1/2 of marinade over fish and distribute evenly. Turn and repeat. 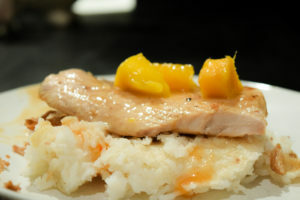 Cover and marinate for 30-40 minutes in the refrigerator. Grill 6 inches from flame for 3 minutes each side, or until it flakes with a fork. Remove from grill and keep warm. Reserve the juice from the fish for the sauce. To serve, make a puddle of sauce on each plate, top with grilled fish, then garnish with lime slices and cilantro. Pour 1 cup coconut cream into a small sauce pan over medium heat. Bring to a low boil, lower heat to a simmer and reduce until slightly thickened. Add juice from fish, lime zest, cilantro, chile, salt and pepper. Simmer for 5-6 minutes. Taste and adjust seasoning. I’m not a huge fan of coconut meat plain, but other than that, the rest of the food was so good. I have tons of pork leftovers for the next few meals!